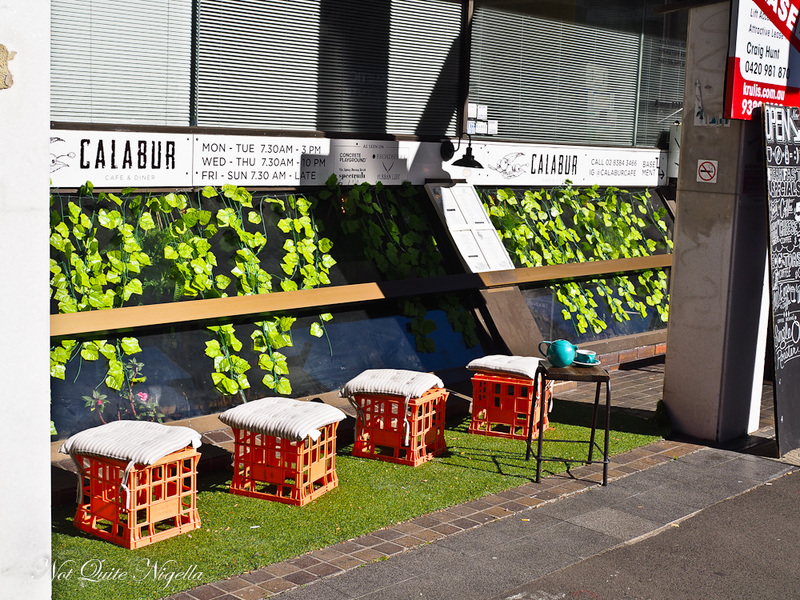 Calabur is a cafe that is a dual prospect-cafe during the day and Asian tapas at night with a strong Thai bent. And wait til you see the food! Calabur's dual identity was so unusual that Nina had decided that she didn't understand the concept and didn't really want to go. But that meant that Nina was missing out. Mr NQN and I arrive at Calabur at 11:40am. 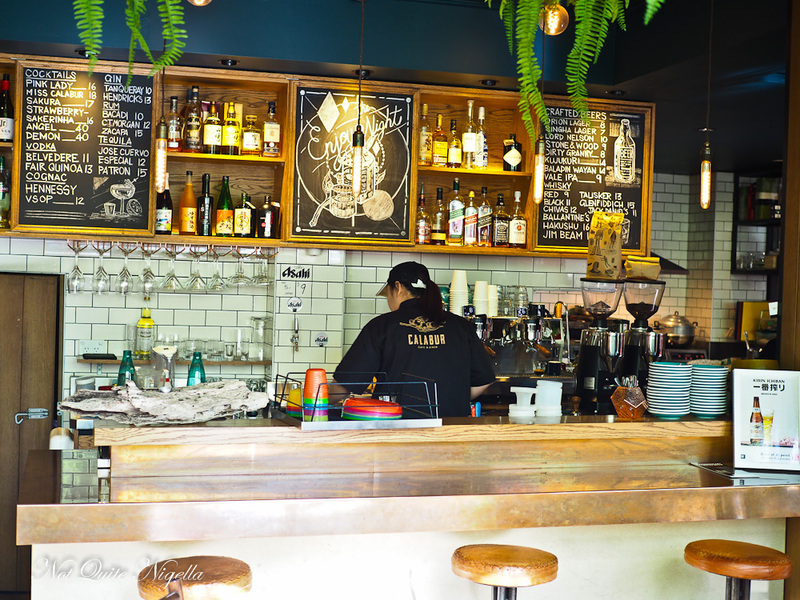 It's a block away from the busy area of Spring Street in Bondi Junction and it is very quiet. Although it was open for breakfast the crowd seems to have dispersed. I'm used to jostling for a table for brunch so this is very strange indeed. They turn the music on as soon as we sit down. 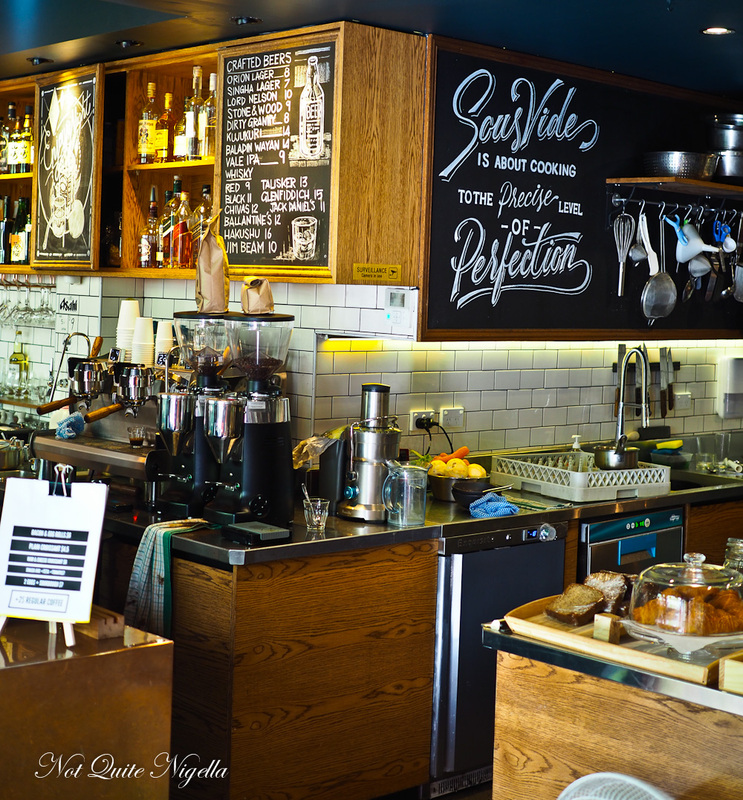 The cafe is set in the basement level of a building and a chalkboard sign proclaims their devotion to sous vide cooking. There are beakers of sugar on the table although the science part is mostly low key. We start with a butterfly pea iced tea for me and a smoothie for Mr NQN. Butterfly pea is a Thai flower that is a pretty blue shade. 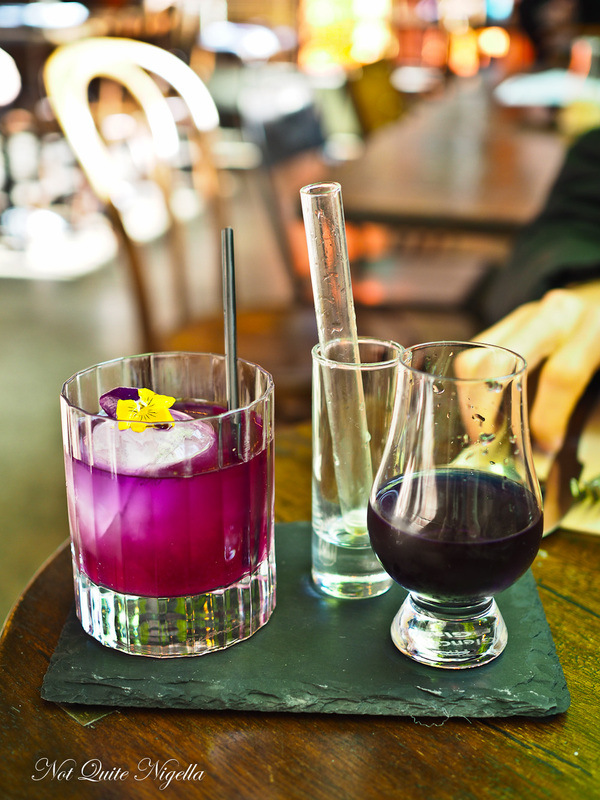 The trick and fun to butterfly tea is that the drink turns from blue to purple with the addition of lemon juice. It's very pretty although the drink itself is like drinking a lemon iced water that isn't very sweet. 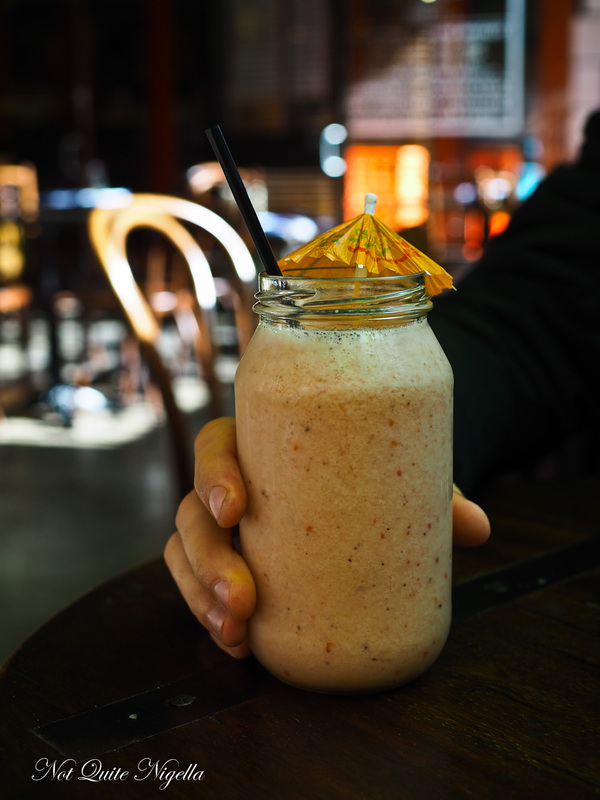 Mr NQN's smoothie is a tropical mix of that is sweet and smooth with the predominant flavours of kiwifruit and banana as well as raspberries, chia and honey. Food does take a bit of time to arrive especially since we were the first customers (by 12:15pm the cafe is half full) and once we see the dishes we see why. The granola fruit market is a crazily pretty granola that looks like it took quite a bit of time to plate up perfectly. 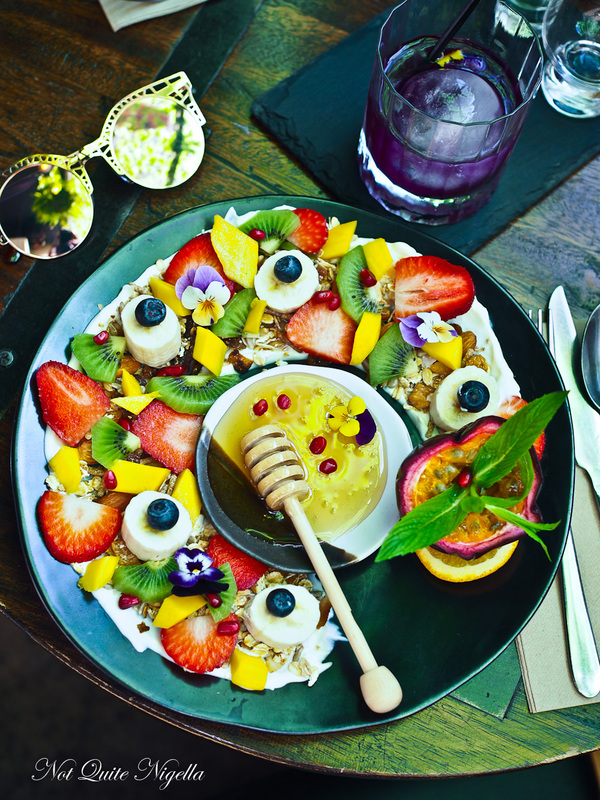 There are fresh strawberries, banana, blueberries and kiwifruit on a sweet yoghurt and a side of honey. Mr NQN is a big fan. This is a similar dish but having not had bacon for a few weeks it was on my mind. 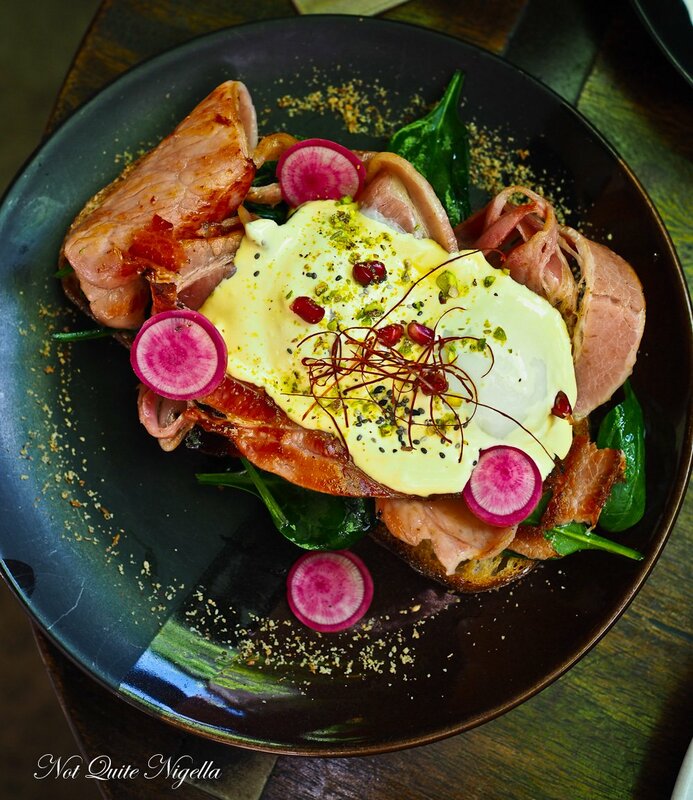 The eggs benedict has a toasted slice of soursough with baby spinach, onsen eggs, wasabi hollandaise and bacon (also a choice of ham or smoked salmon). It's a sizeable dish full of soft, creamy textures from the onsen eggs and wasabi hollandaise (which is light on the wasabi). We also love the very generous portion of bacon served with this too. Because sigh...bacon, it had been too long between eating! 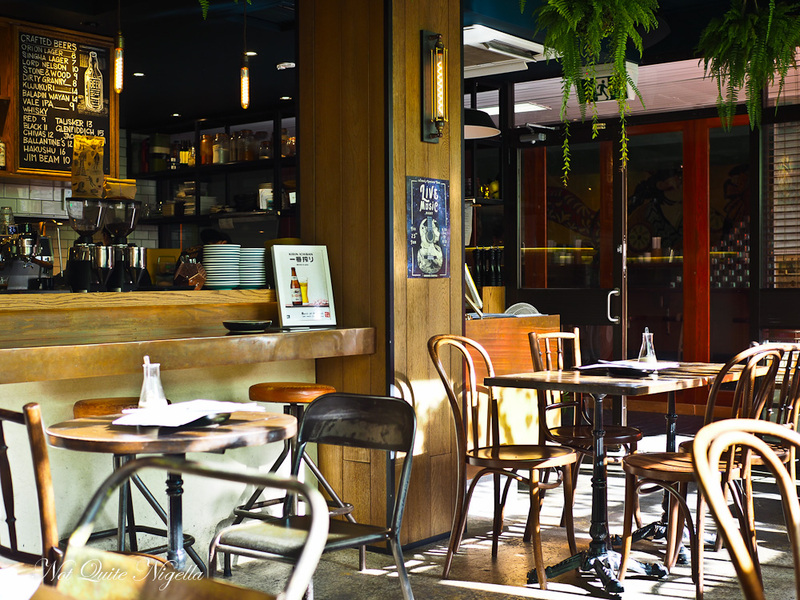 So tell me Dear Reader, do you ever worry if a cafe or restaurant is completely empty when you arrive? And do you sous vide much? What percentage of poached egg yolks are solid in your experience? Is that the sort of thing that you think about? P.S. 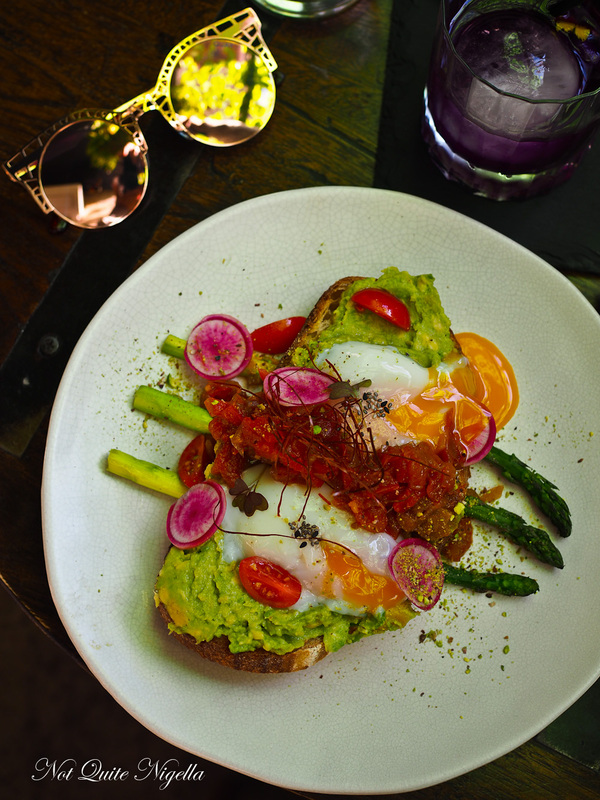 If you're after more beautiful food, check out this article I wrote for Lifestyle on 5 Sydney eateries making beautiful food!